Harrogate Railway manager Paul Beesley says he was able to take a number of positives from Saturday’s NCEL Premier Division defeat at Thackley. A 2-1 defeat in West Yorkshire made it five losses on the bounce for struggling Rail, but their player-boss feels that their performance on the day warranted a result. “We definitely should have got something from the game,” Beesley reflected. “We missed two good opportunities in the first half, whereas they took theirs and at 2-0 down we were up against it. “We got back in it at 2-1 early in the second period, and without creating loads of chances I thought that we were fairly dominant. Despite being satisfied with his side’s performance, Beesley was keen to stress that that playing well is not enough, and that results need to follow. “It’s no good being the better team but still losing,” he added. “We can’t afford to keep getting beaten. I don’t think we are a million miles away from turning the corner, but we’re probably going to need to bring in some players. 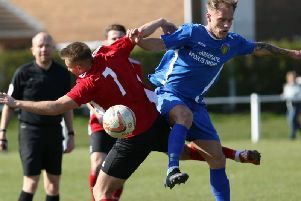 Railway handed a debut to centre-half Toby Lees, signed from Knaresborough Town, on Saturday, but were without skipper Simon Parkes who has gone the other way to join the NCEL Division One outfit. Beesley was hopeful that Lees’ presence would help shore up his side’s leaky back-line but Rail found themselves two goals down before half an hour had been played. Ben Joyce headed home following a free-kick to give Thackley the lead after 11 minutes. And the high-flyers looked to be cruising to victory when the same player doubled the advantage with a deflected effort in 27th minute. There were no more goals in the first period, but Rail reduced the arrears shortly after the resumption when Greg Kidd nodded home from Ryan Sharrocks’ corner. Rail were on top for most of the rest of the contest, but were not quite able to force a much-needed equaliser.